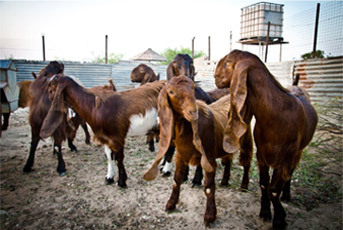 Jamnapari (or Jamunapari) is a breed of goat originating from Indian subcontinent. Since 1953 they have been imported to Indonesia (popular as Etawa goat, and its mixture with a local goat called "PE", peranakan Etawa or Etawa mix) where they have been a great success. It is bred for both milk and meat. The name is derived from the rivers Yamuna, Jamuna (West Bengal) and Jamuna (Bangladesh) of India and Bangladesh. This breed is one of the ancestors of the American Nubian.There is a large variation in color but the typical Jamnapari is white with patches of tan on the neck and head. Their heads tend to have a highly convex nose, which gives them a parrot-like appearance.